Fr. Roger-Thomas Calmel, O.P. 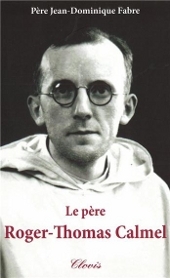 (1914-1975), was a prominent French Dominican and Thomist philosopher, who made an immense contribution to the fight for Catholic Tradition through his writings and conferences. Here is a video interview with his Dominican biographer, Père Jean-Dominique Fabre, O.P. "Liturgical Counter-Revolution: The 'hushed' case of Fr. Calmel" (ConcilioVaticanoSecondo.it, February 17, 2014). Modernism makes its victims walk under the banner of obedience, placing under the suspicion of pride any criticism whatsoever of the reforms [Vatican II], in the name of the respect which one owes to the pope, in the name of missionary zeal, of charity and of unity." "Tradition Will Triumph. We are at peace on this point. Whatever may be the hypocritical arms placed by modernism in the hands of the episcopal collegialities and even of the vicar of Christ, tradition will indeed triumph: solemn baptism, for example, which includes the anathemas against the accursed devil will not be excluded for long; the tradition of not absolving sins except after individual confession will not be excluded for long; the tradition of the traditional Catholic Mass, Latin and Gregorian, with the language, Canon and gestures in conformity with the Roman Missal of St. Pius V, will soon be restored to honor; the tradition of the Catechism of Trent, or of a manual exactly in conformity with it, will be restored without delay. On the major points of dogma, morals, the sacraments, the states of life, the perfection to which we are called, the tradition of the Church is known by the members of the Church whatever their rank. They hold fast to it without a bad conscience, even if the hierarchical guardians of this tradition try to intimidate them or throw them into confusion; even if they persecute them with the bitter refinements of modernist inquisitors. They are very assured that by keeping the tradition they do not cut themselves off from the visible vicar of Christ. For the visible vicar of Christ is governed by Christ in such wise that he cannot transmute the tradition of the Church, nor make it fall into oblivion. If by misfortune he should try to do it, either he or his immediate successors will be obliged to proclaim from on high what remains forever living in the Church's memory: the Apostolic tradition. The spouse of Christ stands no chance of losing her memory." "There is no evolution in dogma, only perversion. The Bride of Christ never loses Her memory." "The Virgin, Mother of God, the Virgin of the Stabat, of the Pentecost and of the miraculous intervention throughout history, the Virtin Mary coredemptrix will keep safe in the Holy Church not only the data instituted by the Lord but also the means from ecclesiastical origin by which the Spouse of Christ will unswervingly stand in the middle of men, both as mediator of salvation and home where God dwells, until the eternal day of the Parousia of our Beloved Savior." "The only authentic and saving encounter of the church with the world is that of the Confessors without stain, of the inflexible Doctors, of the faithful Virgins and of the invincible Martyrs, covered in the red tunic colored by the blood of the Lamb. ... We must separate ourselves from the world when we are not able to do as the world wishes without offending Christ." "No one in the Church, whatever his hierarchical rank, be it ever so high, no one has the power to change the Church or the Apostolic Tradition." "In the Catholic Mass, the priest does not preside in just any manner; he is marked with a divine character which sets him apart for all eternity and thus he acts as the minister of Christ, who performs the Mass through him; he couldnever be likened to a Protestant minister, who is delegated by the faithful to ensure the good order of the assembly. This role is obvious in the rite of Mass established by St. Pius V; it is obscured if not suppressed entirely in the new rite." "Some object that ... efeining and condemning is not the right method. Very well. Is there any other method that is true to the faith? In the absence of definitions you will only bring erring souls to a vague state of almost-believing. I fail to see how you can claim to be pastoral in this way, and to be seeking the good of sould -- truth for the mind, and conversion for the heart." "Our Lord in His church is in His death-throes ... in His death-throes because His Church is being buffeted, hindered, obstructed and resisted from within in Her prime task of bringing the Redemption to souls. Not that She is about to disappear, because the gates of hell will not prevail against Her, but that Her own sons, and amongst them leadrs of the hierarchy, are mistreating Her in so vile and wicked a fashion that She can no longer move without crashing to the ground at each step, fainting with exhaustion." "Why the Latin Mass ONLY? ... to receive, without risk of being deceived, the incarnate and immolated Word of God rendered truly present under the Sacred Species." "The Modernist is an apostate and a traitor." "The simple Christian who, consulting tradition on a major point known to all, would refuse to follow a priest, a bishop, an episcopal conference, or even a Pope who would ruin tradition on this point, would not, as some charge, be showing signs characteristic of private judgment or pride; for it is not pride or insubordination to discern what the tradition is on major points, or to refuse to betray them ... is not exercising private judgment; he is not a rebel. He is a faithful Catholic established in a tradition that comes from the Apostles and which no one in the Church can change. For no one in the Church, whatever his hierarchical rank, be it ever so high, no one has the power to change the Church or the Apostolic tradition." "The Mass belongs to the Church. The new Mass belongs only to modernism. I hold to the Mass which is Catholic, traditional, Gregorian, because it does not belong to Modernism.... Modernism is a virus. It is contagious and one must flee from it. The witness is complete. If I give witness to the Catholic Mass, it is necessary that I abstain from celebrating any other Mass. It is like the burnt incense before the idols: either one grain or nothing. Therefore, nothing." This interview is most encouraging thing I have read for a long time. He has set my faith back on course when the antics at home and in Rome are undermining the faith of my childhood. I am no longer fearful of the future. I put my trust in God and His holy Catholic Church which will never be destroyed by the haters of tradition. Thank you very much. What little I read here is tremendously moving, but my French is now limited to a few words and phrases, definitely inadequate to follow this interview. Is there anywhere I might find an English sub-title or better, a script in English of the interview? Have been looking on the internet and while there are editions of Pere Fabre's biography of Pere Calmel, and one of two of Pere Calmel's books available, apparently they are limited to French with no English translations to date. Any help here? Not much in English, I'm afraid. Take a few months and learn the French. Certainly worth it. If you don't have to worry about pronouncing it, it's not that hard. Good luck.